Hello and welcome to a special edition of A Christian Viewpoint. We’re blessed to have author, constitutional attorney, and Bible scholar Stephen Pidgeon in the studio. He’ll be introducing and sharing some teachings from the Cepher. 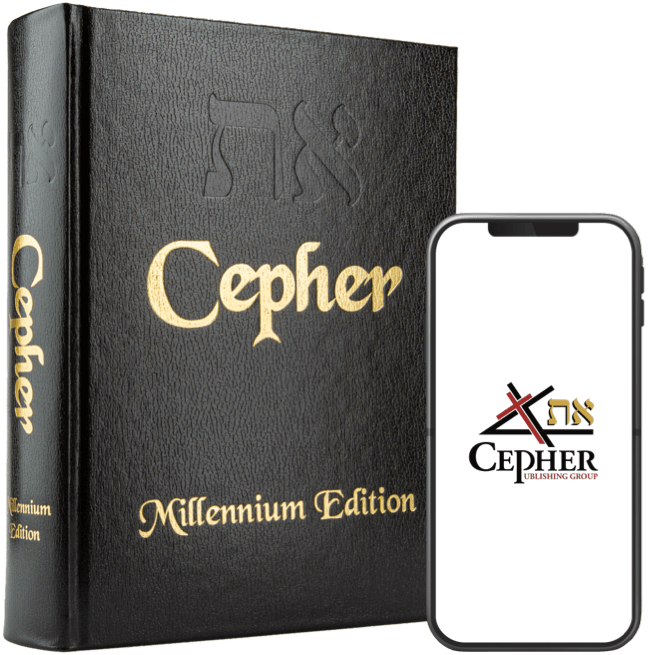 Cepher is a Hebrew word meaning “book, writing, letter, or scroll”. The Cepher includes all the seventy-four books previously canonized as the Bible, as well as the book of Enoch, Jubilees from the Dead Sea Scrolls, and others. So, sit back, learn and enjoy. Stephen, take it away. Thank you Skip, it is my great pleasure to be here with you, to present to you our most recent publication, the Eth Cepher. The Eth Cepher is the most complete and accurate transliteration and translation of the Sacred Scriptures available in the English language today, and I wanted to explain to you some of our reasoning behind publishing this and why we did what we did; which we think is very important. And, so, I am going to begin with first the introduction of the Sacred Name which we placed in the text. And this becomes a very big issue for those of you who are students of the Bible and Sacred Scripture. In all of your English speaking Bibles, you open up the book and you will find the word LORD placed throughout the text in both the Old and New Testament. This word LORD is actually a substitution. It is not a transliteration or a translation because the word it replaces in the Hebrew is what’s called the Tetragrammaton, which is the four Hebrew letters Yod Hey Vav Hey. Sometimes you have heard it pronounced Yahweh, or some other people might say Jehovah, but it appears in the Old Testament over seven-thousand times. In the New Testament, you see in the Greek ‘Theos’ - which has the same reference as the Yod Hey Vav Hey. However, we unified the text throughout from the beginning to the end to actually put in the Name, because we are called upon to put in the Name. In fact, there are passages in Isaiah (Isaiah 61:1-2) that say proclaim and publish the Name of the Father, and in fact in 2 Joel (Joel 2:32) it says that those who call upon the Name shall be those who are delivered. So it becomes very important, and it’s very much a part of who we are as Believers, to call upon the actual Name- without substitution. It was only in the second-century B.C. that the Rabbis, who at that time had written down the Oral Law (and who had) decided to place a fence around the Sacred Name as part of the oral tradition. This was part of Rabbi Elder Hillel who also did other things in terms of changing the Sabbatical Year and made some other moves. But what you look at and what you determine is that this business of putting a fence around the Name then disguised the Name from the Jewish people. So instead of saying the Name they would say Hashem which means, “The Name.” This tradition later became part of the Christian world where the word Hashem then was translated into the English language as LORD. But the term LORD is not what appears there, it’s not a translation and it’s not a transliteration. Instead, what appears there is the most powerful word in all of existence; which is the exalted name of YAHUAH. Now, some people have said Yahweh, you might hear Jehovah, you might hear Yahovah, and there are people - for instance in Israel there’s a group of Believers - that go by the name HavaYah; which is a device to disguise the Name from Yahavah to HavaYah, so that they don’t actually pronounce the Name. However; under the oral law, it was a death offense to pronounce the Name, and that continues to be true today. It’s a great offense in Judaism to pronounce the Name. Yet, the Disciples of the Messiah did in fact pronounce the Name, and they were beaten for doing so. And after they were beaten for doing so, they stepped outside and pronounced the Name again! And if you recall, it is the Messiah Himself who says, “I come in the Name of the Father, but you do not know me.” Why did they not know Him? Because they had forgotten how to pronounce the Name, so they didn’t recognize who it was. So the first thing that we did (was) we decided we are going to place the Sacred Name in the text. Well, this was easier said than done, because we weren’t quite sure as to how to pronounce the Name. We could read the Hebrew, but remember that the Hebrew has no vowels, it’s all consonants - particularly before the Masoretic Text - all consonants, no vowels. So, you’re looking at this idea of what is the word here, and how do we pronounce it? So we spent three and a half years researching that particular topic. And, I made three trips into Israel for purposes of making this determination. And, it was very interesting what happened, how we discovered the actual pronunciation. There were several people here in the United States whose research indicated that the pronunciation of the Name was YAHUAH- YAHUAH which was the Yod (YAH), Hey (Hoo), Vav - and the vav would be the vowel to the Hey. Yah-hoo-ah … YAHUAH. And so we sought this out when we were in the Holy Land, and it was confirmed by a woman up in the north part of the Sea of Galilee. There we were, we were at Ginosar which is at the very northern end of the Sea of Galilee, just up the road from Dalmanutha, the ancient ruins up from Kapharnachum (Capernaum) where the Messiah taught, up from the Mount of Beatitudes. And we’re talking with this woman, her name was Carol, and she said that she was Iroquois; that she came from the one of the Algonquin Nations that were along the Saint Lawrence River. And that the ancient language of the Iroquois actually pronounced the Name of YAHUAH. And she sang to me one of their ancient songs from which they got this name and it was an Ancient Hebrew text. And it was confirmed again in Yerushalayim where we looked at what is this proper pronunciation of the Vav, and in this context it is ‘hoo’. Now, there is more testimony that goes beyond this. For instance you can take a look at the current Prime Minister whose name is Netanyahu. Many of the names, as we transliterated the names from the original Hebrew into an English that actually transliterates the name, we discovered that many of the names of the Prophets had Yahu at the end. For instance Isaiah was actually Yesha’yahu (Yeshayahu or Yeshayah), Jeremiah: Yirmeyahu, Zechariah: Zakaryahu, Obediah: Ovadyahu. So when you look at those names, Ovadyahu means what? The servant of YAHUAH. Zekaryahu means the publisher of the Name of YAHUAH, and Yesha’yahu is the salvation of YAHUAH. And so these names begin to take on specific meanings. And so, as we’re looking at this, we see this Yahu, Yahu, Yahu. You see the Name Yah set out specifically in the Psalms - we came to conclude that this Name was YAHUAH. Now, that Name has a meaning… YAHUAH... Yah - I AM… so that the Name that is given by the Father to Moshe in the burning bush. Moshe says, “Well, who am I going to tell them sent me?” And the burning bush speaks back to him in the Hebrew language and says Eyeh Asher Eyeh - I AM that I AM. I AM who I will be, I will be what I will be - Eyeh Asher Eyeh - so this YAH begins to appear; the Yod Hey Vav Hey. Yah - I AM, who in the Hebrew language means “He” (because who means “he” - he means “she” and dog means “fish” keep those in mind for you if you’re studying Hebrew). So the YAHU … I AM He … and this word HUAH also has a meaning in the Hebrew; HUAH means “breathes life”. So the Name YAHUAH is I AM HE WHO BREATHES LIFE. This is its meaning. This is what we call its Remez meaning. Its Pashat meaning is YAHUAH straight forward - this is the Name of the Father. Now, the Son says, “I have come in my Father’s Name, yet you do not know me.” Because as we looked at His Name, we determined that He had the same name as the son of Nun, that is to say we call him Joshua, but in the Hebrew, Yahushua … and the formal YAHUSHA. So you see, YAHUAH is now YAHUSHA so that the Son comes in the Name of the Father… YAHUAH – YAHUSHA. The SHA has a particular meaning too because sha means “salvation/saving”, so Yesha is savior in Hebrew. Salvation is Yeshua, and when The Father saves - YAHUSHA. The Father Saves YAHUSHA. So these are the Names we have put forward: YAHUAH; the Name of the Father, YAHUSHA; the Name of The Son. YAHUSHA. And when we talk about the Christ, which is a Greek term, we use the Hebrew term Mashiach – Messiah, and The Messiah- HaMashiach … YAHUSHA HAMASHIACH. So, now you know His Name and how it was pronounced by the disciples in the first year. This was one of the first decisions we made in the Cepher was to set forth the Sacred Names as they were pronounced, and as they are to be pronounced. Now, there is plenty of room for leeway. Some people like to say Yahweh, that’s fine. We say YAHUAH. Some people like to say Yahshua which is also fine. Some people say Yeshua which is also fine. These are all kind of a blending of the Name. They are versions of the Name, a more modern version of it. Let’s go back to this name, Netanyahu, the current President, Prime Minister excuse me, of Israel. Now the current Prime Minister of Israel, he has the name Netanyahu. Now on one hand you can say Netanya, the city of Netanya and hu, so, Netanyahu; “he is from Netanyah” or “the man from Netanyah” - Netanyahu. But, if you have this as Netan-Yahu … now Netan is the gift, Yahu is God. Netanyahu is “the gift of God”. So, the Hebrew names have specific implications. We added them seven-thousand places in the Old Testament. We added them anew in the New Testament. That’s the first addition we made. So, you see the armor of God that is talked about by Paul is set forth first in the Wisdom of Solomon chapter five. Now, there’s some other interesting passages that have been completely ignored that we set-forth when we elected to put more books in the Cepher. And these selections included selecting the books of the Apocrypha and all of those writings, the second Temple writings, and also coming together and putting in these books that came out of the Dead Sea Scrolls; extremely important book - books which are now being widely read. And so many people who are engaged in modern prophecy … whether you’re talking about Chuck Missler or you’re talking about Tom Horn, or Steve Quayle, or L.A. Marzulli, or any of the people that are on this so-called cutting edge of prophecy … they are all speaking about the Book of Enoch. Which was found, five copies were found, in the Dead Sea Scrolls at Qumran. So, we included Enoch. We also included this fabulous book called Jubilees, or in Hebrew, Yovheliym – Jubilees. Six copies were found in the caves of Qumran, and it had been part of the Bible and the Coptic Christian Church for years. It’s been included in the Russian Orthodox and the Eastern Orthodox traditions, and it was also included in the Syriac traditions, it’s called “Little Genesis”. A very important book that answers so many questions you might have about the original creation. Like one of the questions that people ask is, “Before Israel, before Jacob became Israel, were the generations before him, did they go to heaven?” They ask questions about Abraham and about Isaac, questions about Noah, a question about Adam, and the answer is those were the twenty-two generations that comport with the twentytwo letters of the Hebrew aleph-beit that gave formation to the rise of the house of Israel. And, if you recall it is in the New Testament that says, “All Israel shall be saved.” And who is Israel? All those who are saved; therefore, all Israel shall be saved. And it is the Beit Yisra’el - The House of Israel - that presents itself as the Bride to the Messiah- to HAMASHIACH. And as these names became more and more present, we began to discover some very important things. Now, as we discovered these things, and as we are looking over the Hebrew, we discovered some other interesting anomalies. One of the big ones, and it’s a big one for all those people who feel comfortable in their Luciferian worship, the term Lucifer doesn’t appear in any of the texts. It doesn’t appear; it’s a constructed name. It is not a transliteration and it is not a translation, it is a substitution. That is to say, you read one word that says dog and you decide to use the word fish or you see dog and you decide to use the word automobile. It’s no correlation to what is there, so what appears in the actual Hebrew in Isaiah 14 is “heylel ben yallal shachar”. That’s what actually appears there. Now some people have said that heylel must mean light or halo from which the word halo comes. And if you look closely at a halo, you will see a sickle moon with a head in the middle of the sickle moon … very similar to the sickle moon with the star - which is the symbol of Islam – halo/ heylel. But this heylel, so many people have construed this as being light. Well, heylel means what? Does it mean light-bearer? That’s a guess. That was a guess as to what the Hebrew was because the word doesn’t appear in Hebrew. And the reason it doesn’t appear in Hebrew is because it’s not a word in Hebrew, it is a name in Hebrew. morning. Now, there is a difference. Son of the howling morning. The Cepher is the only English Scripture in existence that includes that phrase. Heylel, son of the howling morning and Heylel is construed as a proper name. Chapter 1 Now, we get into other difficulties as well. I was researching this the other day, and I found in Matthew 23:1 that every English edition of the Bible has a math problem. Well, okay, so if we take the number forty-two and we divide it by three, we get fourteen and fourteen and fourteen. Matthew 1 tells us, it begins right away with, there were fourteen generations from Noah to Abraham, fourteen from Abraham to David, fourteen from David to the Messiah. But when you count up the generations from David to the Messiah you get thirteen. Why? Because every English text in Matthew 1:16 says, “Joseph, the husband of Mary.” So the genealogy in Matthew 1 - in everybody’s English Bible - is about the genealogy of Joseph, and when you look at Luke 3, you’re talking about the genealogy of Joseph. But the genealogy of Joseph in Luke 3 is completely different than the genealogy of Joseph in Matthew 1. Well, how can you possibly reconcile this? And furthermore, the last fourteen are not fourteen, it’s only thirteen. So, you’re one short of a full generation. So, how does that happen that we have this shortness in the generation in Matthew 1? Because of one word … Joseph … was yes, the husband of Miryam, but Joseph was also the name of her father! Now, when you recognize that Matthew 1 is talking about the genealogy of Miryam, now number fourteen is Yeshua HaMashiach … YAHUSHA. He is number fourteen. Miryam is number thirteen, and Yoceph - the Father of Miryam - is number twelve. Now you gotta recognize in the Hebrew there is no written word for husband, and there is really no word for wife. What you have is isha and ish. So, Adam took Eve to be his isha; his woman. And, Eve took Adam to be her ish; her man. Simple as that. So, when you get into this confusion about what takes place in Matthew 1, it becomes pretty confusing. What do we know about it? We know that if you clear up the problem, and you correct the language that said her man, and it turns out to be her father, you end up with fourteen generations perfectly, and the lineage is one of Miryam, and the lineage is one of Joseph. Miryam in Matthew, Joseph in Luke. And let’s take a look at this for just one moment because both of them can trace their lineage to David, both of them can trace their lineage to Zerubbabel. Zerubbabel was the rightful king by bloodline of the House of Judah. If you recall it was Jehoiakim who was taken into captivity in Babylon. Jehoiakim, there was a curse placed on him that says no more can the house of Jehoiakim - the stem of Jesse - sit on the throne over the House of Judah. And, so, this was the curse, but the bloodline continued. And the bloodline continued such that Joseph, the husband of Mary, was the rightful heir to the throne of the kingdom of the House of Judah. And the bloodline of Miryam was also in the line that established her in the rightful line of the heritage of the kingdom. She is in this line of the stem of Jesse. So, from both sides you had royalty. And, to them is born this Son. But, the Son is conceived of an immaculate seed and an immaculate egg. Because as it says in Hebrews, it says that He was without descent. So, you have this immaculate conception of this HaMashiach who has a bloodline from His mother that establishes Him on the throne, and the bloodline of His father which establishes Him on the throne, but He does not hold the curse, of the direct DNA from Jehoiakim. So, He is able to take the throne, and He does in fact take the throne when Pilot presents Him, and he says, “I present to you the King of the Jews.” - orally, and then he wrote it down. But what did he write down on the cross? In Hebrew, this is why the Name becomes so important, that we know this. Because in Hebrew he wrote on the cross Yahusha ha’Netzari u’malek ha’Yahudiym. Yahusha, that is to say Jesus/Yeshua/Yahshua. HaNetzari … now ha’Netzari means two things … one, of Nazareth - the Nazarene of Nazareth - right? But ha’Netzari also means something else … it means the branch. What does Zechariah say? I will give you the branch. What does Isaiah say? I will give you the branch. YAHUSHA … the Branch … HaNetzari; u’malek – King; Ha’Yahudiym - of the Jews. Now, let’s look at what this spells out in terms of its acronym. YAHUSHA: yod. Ha’Netzari: hey; u’malek: vav; Ha’Yahudim: hey. Yod Hey Vav Hey … the tetragrammaton - YAHUAH. So, here you are a Sadducee and you see Pilot put on top of the cross – YAHUSHA ha’Netzari u’malek ha’Yahudiym and you see the Yod Hey Vav Hey staring at you, and you see Him proclaimed to be the Branch, and it’s written in three languages, and it’s written by the governing authorities, and it creates as a matter of Roman law His kingship over the kingdom of the House of Judah. And there has never been another king, by the way, since then. So, the oral law was established in writing, it is set now in stone, YAHUSHA and the acronym that they see before them is the Yod Hey Vav Hey, the tetragrammaton, so that even though they did not know the Name, they could not deny the Name appeared on the cross. And so they go to Pilot and say, “Hey - you gotta take that down!” You gotta say ‘claimed to be king of the Jews’, ‘thought he was king of the Jews’, ‘could have been king of the Jews’, ‘alleged king’ … something like this. And Pilot says, “What I have written I have written.” So, these are the kinds of things that become important with these transliterations. Now if you look at our Eth Cepher, you see here the Eth - Aleph Tav. Well, we stumbled into this Aleph Tav when we were walking through the streets of Jerusalem. Being led by the Spirit, we ended up at the birthplace of John the Baptist in a place called Ein Kerem. And we’re walking through this yard, and we see all of these passage in Luke being set out in fifty different languages. So we stumbled upon the Hebrew, and we saw in the Hebrew this Aleph Tav … Eth … this word Eth. We begin to look at this word, and this word becomes extremely problematic because it too appears in the Old Testament 6,000 times without interpretation, 260 times in the New Testament it appears without interpretation. What is this Aleph Tav? It’s the first and the last letter of the Hebrew aleph-bet; the Aleph Tav. And as we looked, so we compared this to what was being presented in the book of Revelation, which we call Chizayon, and in the book of Revelation 9:11 it says what? It says his name was Apollyon in the Greek. In the Hebrew his name was Abaddon, but in the Greek Apollyon. Why did he put ‘but in the Greek’? He says it again in Revelation 16:16 … because the book was written in Hebrew. Eighty percent of the book of Chizayon is Hebrew quotes. It was written in Hebrew. So, you have this idea that Chizayon was written in Hebrew, and if it was written in Hebrew, then MASHIACH did not say, “I am the alpha and the omega.” What He said was, “I am the Aleph Tav, I am the beginning, the end, the first, the last; the Aleph Tav.” The Aleph through Tav - which is to say, “I am every spoken conceived and written word of YAHUAH.” This inception of YAHUAH is the Word, because the Word was made flesh and dwelt among us, and through Him all things were made. The Aleph Tav. So we presented this Aleph Tav. Now what does it present? It presents the divineness – the divineness of what is being pointed out in the text. When it says Eth … when it says Eth lechem … give us our daily bread, give us our Eth daily bread, give us our divine daily bread. You see? And we’ve added this in 1400 places throughout the text. So, what you see in the Cepher is you see a complete collection, not only of the apocryphal books, second temple writing, but also of those books gathered from the Dead Sea Scrolls; critical to scriptures. Yovheliym – that is to say Jubilees, Chanok - that is to say Enoch, and the book of Yashar – Jasher, which is an historical text around the time of the Exodus from Egypt. And with all of these books put into the collection, the Sacred Name is set up throughout, and the Aleph Tav put in place in 1400 places. You have text that you can rely upon. You can open it, look and say, “I want to see what was actually being said here, and who actually said it.” You can rely on its authenticity as for what is there, without a bunch of political spin or a bunch of nonsense drafted by other people. We also added the 29th chapter of the book of Acts. Your book of Acts ends at the 28th and it does not end with an “Amen” like every other book in the New Testament. But we have found the 29th chapter of the book of Acts, which tells you that Paul did not in fact die in Rome as the church would have you believe, but in fact went on to Spain, went on to England, back to Switzerland, and ended up dying in Macedonia. So, such is the text, the Eth Cepher. We do have a website where you can find it. I would encourage you to pick it up if you are a student of scripture. This is the most complete, most accurate text ever set forth in the English language of the Sacred Scriptures.